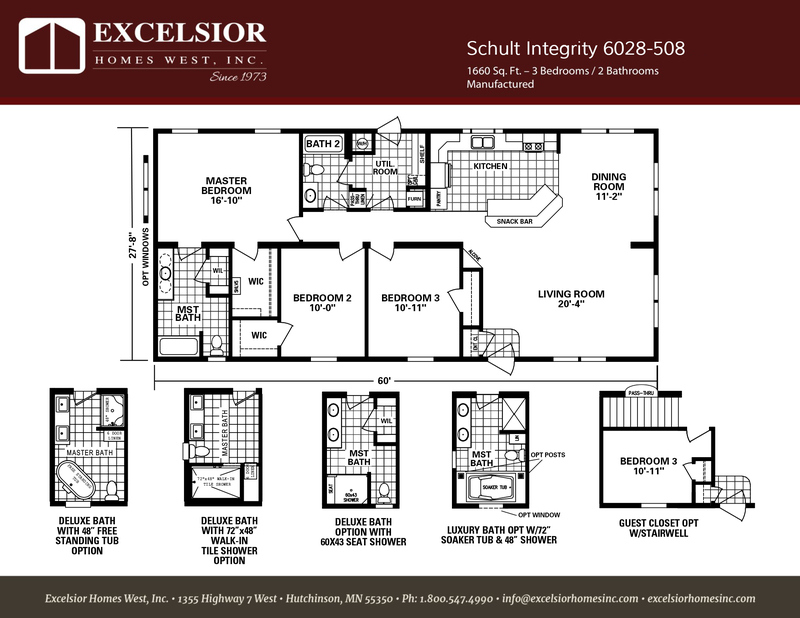 Schult Integrity 508 Modular / Manufactured | Excelsior Homes West, Inc.
Are you looking for a modular home to place on your Minnesota lake lot? The Schult Integrity 508 may be the perfect layout for you! The Schult Integrity 6028-508, previously the Schult Timberland 6028-508 and Integrity 6028-508, is a three bedroom, two bathroom home with over 1600 square feet of living space. If you are looking for a lake cabin, this floor plan would be perfect. The living room, dining room, and kitchen all open up to a wall of windows, perfect for a lake view. You could also add some patio doors opening onto a deck for some outdoor living space. Enjoy those beautiful Minnesota summer nights with this Schult home! At Excelsior Homes West, Inc., we can help you find your dream lake cabin. Call us today for more information! The Schult Integrity 508 can be built as a modular or manufactured home and has many options for customizing the floor plan. Are you looking for a modular or manufactured home? The Schult Integrity 508 has the option to be built as either. For the modular floor plan, place the home on a crawlspace or basement and for the manufactured plan, add frost piers for the foundation. The decision is yours! Visit us today and see the different options we have to customize this floor plan. Choose from different flooring options, countertop finishes, back splash tile options, and more! Contact us today for pricing.